New generation of life saving technology with CPR advisor for most efective CPR support. The 500P model is capable of providing feedback to rescures on the effectiveness of CPR, it uses both ECG and IC measurements to analyse and effectiveness and rate of compressions given and based on this will advise the rescuer to push harder, faster or slower as appropriate. The 500P advises you verbally and visually as to the success of your CPR. 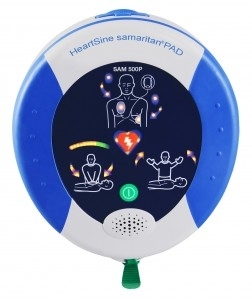 User friendly - The samaritan PAD with CPR advisor features easy to understand visual and oral prompts that guide a user through the process.